One week ago a friend's 12 year old son ended his life. Yesterday, she laid him to rest. I cannot begin to imagine at any age, but at 12? I have never had to walk this horrible road of the loss of a child. My heart cries for my friend and her loss. But my pain is nothing compared to hers. As a week has passed and I think of this horrible tragedy, I wonder what good could possibly come of it. Nothing. That's what. Nothing. A mom is without her son. A father without his boy. Brothers and sisters without their brother. No answers. Just pain and loss. Nothing good. While I see in my human eyes that there is nothing good, here are a few lessons I have learned in this passed week. 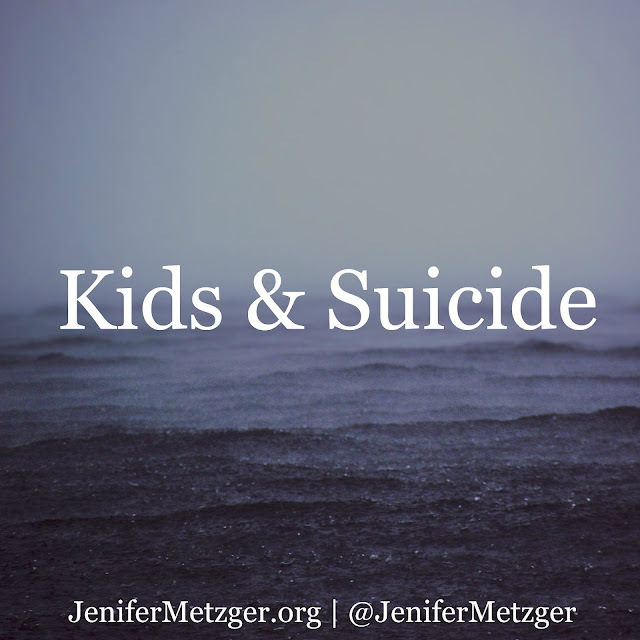 •Talk to your kids about suicide. It doesn't matter how young you think they are, talk. Open the lines of communication about this subject. Let your kids know that this is never an option. Let them know they can always come to you. If they feel they can't, tell them to go to a grandparent, pastor, teacher, neighbor, someone, anyone to talk. I've never ever talked to my kids about suicide. This week, I did. It was hard. •Talk to your kids about their friends and suicide. Let them know that it is not a joke. If their friends joke about it, tell your kid to get in their friends' face and tell them it is no laughing matter! Period! If their friend talks serious about it, tell your kids to seek help immediately! Earlier this summer we heard of another acquaintance who ended his life. A few weeks later we heard from a mutual acquaintance that this man went to work that week and told a co-worker he was going to end his life. If his co-worker had spoken up, his sons would have their dad. Do not stay silent! •Stop complaining when your kids outgrow their clothes and shoes! 5 days ago my friend had to buy clothes to bury her son in. So what if your child out grows his/her clothes! You have your child to buy clothes for. Thank God they are with you and growing. I pray I never complain about this ever again. •Tell your kids how deeply you love them. Hug your kids. Kiss them. Tuck them in at night. Show your love through words and actions. Then, go and praise God that you have your child to do these things with. •Pray for the hurting mamas who do not have their children to do these things with. Time does not heal all wounds. It doesn't matter if it was 2 weeks ago or 20 years ago. It doesn't matter if it was from illness, accident, or what caused the death, it hurts. Pray for these mamas. If you have experienced the loss of a child, you are in my prayers, sweet friend. I wish I could hug you close and pray over you personally. I have not walked this road you are walking, and I cannot imagine how hard it has been for you. But I know that God still loves you and He is there for you. Cry out to the Father. To my friend, sweet friend, I know you were an amazing mom. You love your children with your very breath. I am so sorry for your horrific loss. May God wrap arms around you as you cry on His chest. I love you.